Close Encounters showcases a group of sixty-seven portraits of notable subjects by Irving Penn (1917-2009), acquired by the Morgan Library & Museum in 2007. The exhibition demonstrates Penn's incredible achievement as a portraitist and photography's vital role among the twentieth-century arts. The portrait subjects are chiefly writers and visual artists, with a smaller number of figures from dance, music, theater, and film. The group covers the range of Penn's portrait production to date, beginning with a 1944 photograph of the painter Giorgio de Chirico, made in Rome, and ending with a remarkable 2006 portrait of the painter Jasper Johns, made in New York. Every decade of Penn's work is represented in the exhibition. 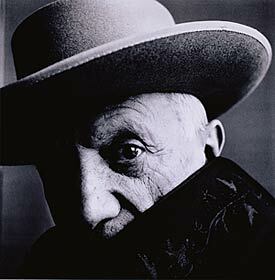 Irving Penn has long been recognized as one of the great portrait photographers of the twentieth century. Since the 1940s, he has recorded notable figures from literature, the visual and performing arts, and other fields. He made many of these portraits for Vogue, where his pared-down, frank compositions helped define the look of the magazine and also established an important aesthetic for modernist photography. Penn's signature portrait style consists of placing a figure in the natural light of the studio with only rudimentary props included to facilitate the composition. This approach produces an intense engagement between the subject and the photographer yet permits remarkable variation. Within this formula, Penn has also produced celebrated group portraits, further complicating the algebra of his portrait sessions. Examples include a 1948 photograph of Italian and American intellectuals gathered at the Caffè Greco in Rome and a 1964 photograph of the architect and designer Frederick Kiesler with his younger counterpart the painter Willem de Kooning, two Europeans who found themselves in New York after the upheavals of the 1930s and 1940s. Close Encounters is international in scope but includes many figures who lived and worked in New York and who helped define it as a cultural capital in the decades following World War II, including Langston Hughes, George Balanchine and the Ballet Society, Saul Steinberg, Truman Capote, Woody Allen, Louise Bourgeois, and Rudolf Nureyev. The group also includes subjects whose own letters, manuscripts, books, drawings, and musical scores from the Morgan's collections are on view in the Engelhard Gallery from 8 January through 6 April. These include John Cage, Marc Chagall, T.S. Eliot, George Grosz, Joan Miró, Richard Rodgers and Oscar Hammerstein II, and Igor Stravinsky. This exhibition is made possible by a generous gift from Richard and Ronay Menschel.